If I’m near a rink, I’ll wander in and take a look. Part of it is selfish. It’s not so much to steal drills, though there’s plenty of theft I’d admit to. But it’s also because I regularly catch coaches doing really neat things. I’m often amazed at just how much imagination coaches use and so I’ll grab the opportunity to watch. This explains why I spent an hour one weekend afternoon watching a top level atom practice. I’ve written about this one before, on Dec. 29, 2015. It was the team that had one coach sort of coaching and the rest of the on ice staff watching. 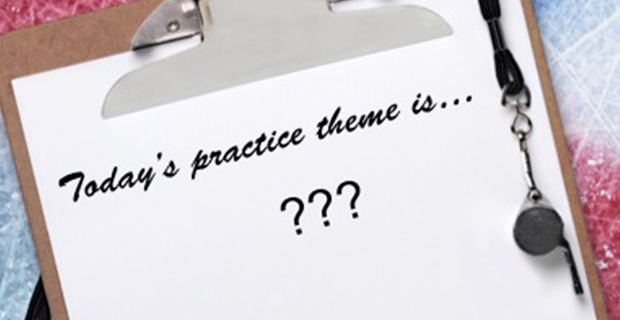 A preamble: every practice needs to have a theme and clear objectives. Even when the drills stink or the feedback is poor, if it’s obvious there was a method to the madness, it’s a start. This one though was a puzzler. As each drill finished, I asked myself if the warmup was over and we’d now get to the practice’s idea. It never happened. What I saw was a collection of drills. Some were okay; a couple inappropriate; none linked to the others. It was as if the coach needed to show his practices had variety. Well, he did have variety. There was a figure eight around circles with a shot drill. A one-on-one attack drill that used a pass from a foward to start. Nice looking one when the pros or juniors use it. A bit of a mess with ten year olds. A neutral zone regroup drill. A 3 on 2 drill. A couple of hard skating drills, you know, to whip ‘em into shape. A faceoff positioning drill where no one really moved unless the coach pointed to a spot to go to. Another bothersome aspect of the practice. Some of the drills were as if the coach had yanked them from a book or junior practice and figured they’d be fine for these littl’uns. The one on one drill was a perfect example. Every play began with a whistle from the coach. Then the kids would make a cross rink pass to a dee - just like the pros - and circle in the centre zone to get one back from the other side - just like the pros - then attack the initial 'D' - just like the pros. Except children on a full size rink take longer, make more goofy passes, often transition poorly, and generally don’t have anywhere near the tactical sense of pros. Which is why pros and juniors are pros and juniors, not ten year olds. In the end, I wasn’t sure what the point of it all was. Tactics? High-paced skill? Use of space? Conditioning? Small group work? There was a bit of everything with none of it linked nor was there any evidence of progressions. Maybe he’s a great coach. Maybe because he has a few colourful drills, he’s seen to be innovative. Or maybe it’s just me, because I just didn’t get it.